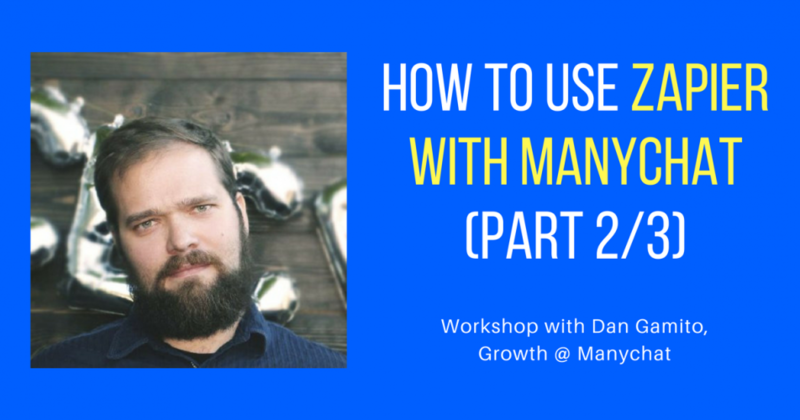 We are super grateful to learn from Dan Gamito who runs Growth at Manychat (among many other hats he wears) on how to use Zapier with Manychat. Part 1 (you can find that post here) describes at a high level why businesses need to use Zapier with Manychat. Think of a 60,000 feet view on the future of integrations with Facebook Messenger! Part 2 (this post) describes practical use cases with step-by-step instructions on how to integrate Zapier with Messenger. We collect email addresses and export it to Webinar Jam + Mailchimp – and test it live getting the welcome email from each CRM. As well as connecting Stripe, Infusionsoft, and other softwares – super powerful. Part 3 (exclusive to our Messenger subscribers – get this post here) is the 30 minute Q&A that 50+ attendees ask Dan on more advanced things you can do. We get super specific on the nuances you need to know as chatbot creators. Watching this part will save you hours of time in the future when you get stuck.